Since 2012, at Bodegas Aradon, we have been using an innovative system based on Geographic Information System with Satellite which we have applied to our vineyards. The goal of this system is to find the ideal moment for harvesting each individual vineyard that we own. This allows us to ensure, that the fruit is picked at its optimum ripeness thus increasing the quality of our wines. This method is based on allocating an average index of vigour and vegetative activity to each individual plot. In addition, we study and analize the evolution of this index during the run up to harvest time. In order to achieve this, we receive several infrared images sent to us from a Satellite, and we then process these images.Thanks to these images we are able to set the individual characteristics of each vineyard, in order to locate, gather and define homogeneous areas according to several agronomic variables. We allocate several colours (red, yellow, green, light blue, and dark blue) to these homogenic areas. From the veraison until the harvest, we frecuently go to the vineyards to take samples of the grapes in order to follow up on the ripening evolution in the different groups of homogenic plots. The information extracted from the samples, along with the theoretical evaluation of the vegetation index and the needs of the winery are the three key factors in determining the fruit qualitative potential. We then organize the harvest according to the selection that we have previously carried out at the vineyards. During the harvest, when the fruit is at its optimum ripeness, we select and group the fruit according to its vinegrowing profile. This means the winemaking process is more efficient and thus we are able to achieve a notable improvement in the quality of the wines. We also record and manage all of the information relating to our vineyards such as, grape variety, age of the vineyard, altitude, soil type, etc. We are thus able to select the fruit from the vines. We strongly believe that this is the key to obtaining wines of the highest quality. 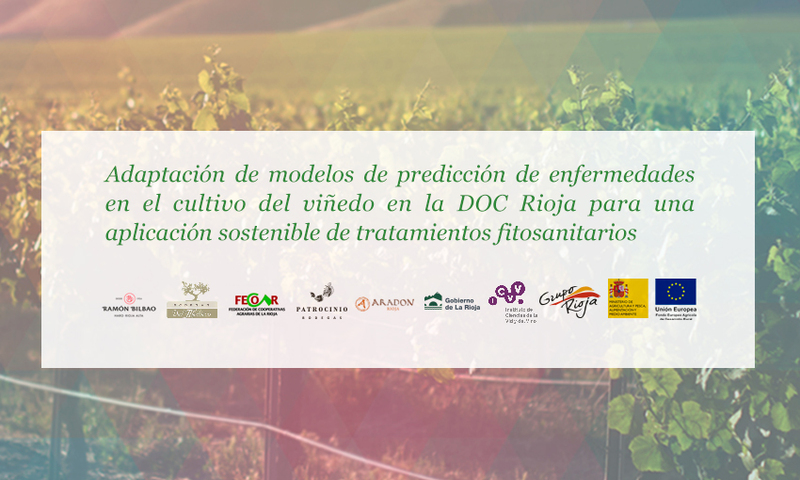 Bodegas Aradón participa en el proyecto de I+D “Adaptación de modelos de predicción de enfermedades en el cultivo del viñedo en la DOC Rioja para una aplicación sostenible de tratamientos fitosanitarios”. El Grupo Rioja coordina un grupo operativo en el que por primera vez, a las bodegas asociadas Ramón Bilbao y Bodegas del Medievo se han sumado la Asociación de Cooperativas FECOAR y las cooperativas Bodegas Aradón y Bodegas Patrocinio. Todos ellos trabajarán con el Instituto de las Ciencias de la Vid y el Vino, la empresa Encore Lab y el Servicio de Información Agroclimática de La Rioja. Los fondos que destinan la Consejería de Agricultura del Gobierno de La Rioja, el Ministerio de Agricultura y FEADER financian el trabajo de estudio y el planteamiento de posibles proyectos, en este caso, con una dotación de 30.000€.